Do you still need a wrapping idea? This is the perfect gift wrap because you can use it over and over and it works for just about any occasion (around the holidays, of course.) If you still haven't tried out My Digital Studio, do it now!! Download your FREE 30 day trial. Then you can decide if you like it or not. You don't have to have our software to use the downloads so definitely download the tag HERE because it's FREE too! This tag is absolutely adorable. I printed a bunch on a sheet and then had SU! print them for me. Yes, they do that. You just add it to your order with other items. SUPER easy and convenient!! I resized my tag to be 1-1/2" wide. In MDS if you select to keep the proportions, you only need to change the height. My striped paper is 5-3/4" x 10" and my polka dot paper is 4-1/4" x 10". If you ever want dimensions on my projects, just let me know. Someday. When I grow up. I want to be just like you. And on that day... I will learn to get SU to print things. Cathy, you crack me up! Printings from Stampin' Up! is really awesome. I sized my tags to fit a bunch on a 12" X 12" sheet of paper and printed a few of those along with other scrapbook pages. Efficient!! I heart them so much! 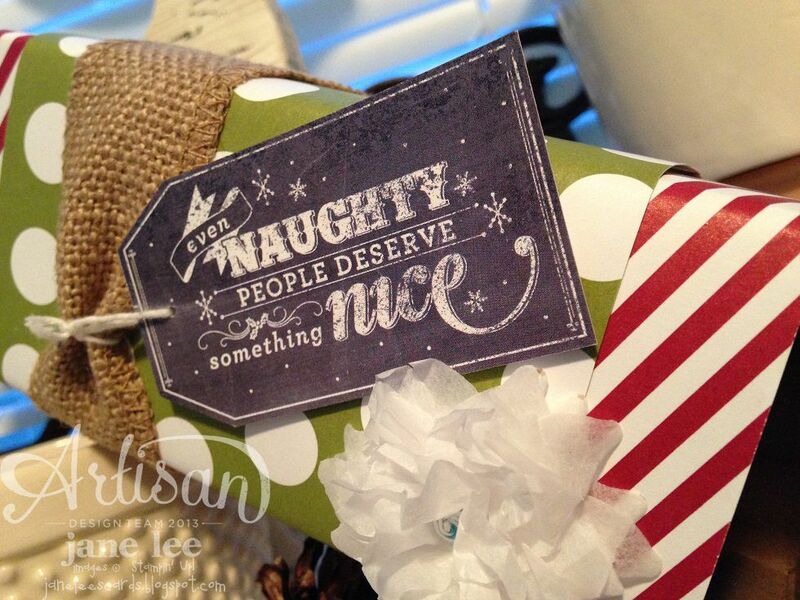 Jane, I just love how you used both digital and traditional supplies to create such a fun gift. Great tag!! On the subject of having SU! print out the tags - You might have to give us a tutorial on how to add it to our order with other items. I am afraid that I am MDS challenged! I open it up and from there I am totally LOST!! I love all of the MDS projects people post but I can't figure anything out. Gail, this is such a great idea! Stay tuned to my blog because I'll put up step-by-step instructions on how to have Stampin' Up! print services used. Thank you for the great suggestion!! So cute!! Definitely a CASE!